Enjoy KFC's free sandwich voucher when you purchase the KFC Canada's Festive Meal for One.Yummy! Plus we are hosting a KFC giveaway for a $25 KFC gift card. A random draw will be made by Random.org on December 20, 2012 from all Canadian entries received. My husband and I love having KFC as a special treat! I love these promotions KFC is offering! KFC has the best fried chicken I have ever had. I like It works on facebook. 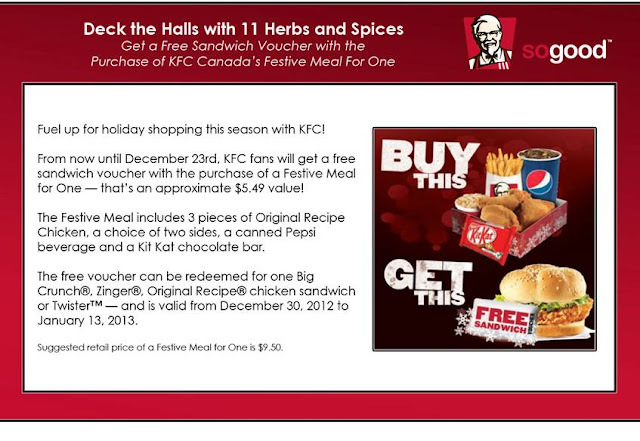 I absolutely love KFC and can't wait to get this deal! KFC is our family's favorite place to get fried chicken, love the gravy as well. LOVE KFC,,thanks for the giveaway! Yum yum! Leanne M I love KFC! Love KFC, thanks for the great giveaway! Sometimes my husband and I get a huge craving for KFC - we're glad there's a KFC nearby. My favourite thing from KFC are their popcorn chicken bowls with the mashed potatoes and gravy. so delicious!! We love KFC. One of the few places where we can order and EVERYONE will eat, even the pickiest of my kids loves their chicken. KFC is my meal of choice for Thursday night take out!!!! KFC is always my choice for Thursday night take out!!! The gravy is the best around! We love KFc in our house! Finger Lickin good!! the kids love KFC, especially toonie Tuesdays.